You see the rose wine glass? We made those for the bridesmaids. And the kit hasn’t changed in the almost 20 years since we bought it. It was a pain! You tape the stencil to the glass and the etching cream bleeds through and smears and it isn’t pretty. But guess what….I now have a Silhouette Cameo that cuts vinyl. And vinyl makes the perfect stencil for glass etching. They also make stencil material that has a sticky back, or you could use contact paper. So while searching Pinterest one day I saw some glasses that state “you have just been poisoned” at the bottom of them. I just knew I wanted to make some, and I knew the perfect machine to make a really good stencil. After getting my Silhouette Cameo for Christmas I joined a Facebook group that has allowed me to learn how to use my machine, share my projects, help others learn how to use their machine and push me to try new things. One of the events they hosted this year was a hand-made gift exchange. Whomever in the group wanted to participate just signed up and the coordinator matched you with another group member. You then made each other a hand-made gift. Sounds like fun, huh? After chatting with my gift receiver I thought she might just be the person to appreciate this fun gift. To the Silhouette I go! I measured the bottom of the glasses. It is important when looking for drinking glasses that the bottom of the glass be completely flat. Typically when etching on the outside of glass you don’t need to flip the image, but with this design it will be read through the bottom of the glass, so it needs to be flipped on the horizontal. Cut your stencil out of vinyl, others have had success with contact paper, but I have yet to try it as a stencil. I used the default vinyl settings and it cut perfectly. Clean the glassware and wipe with rubbing alcohol. When completely clean and dry apply stencil. 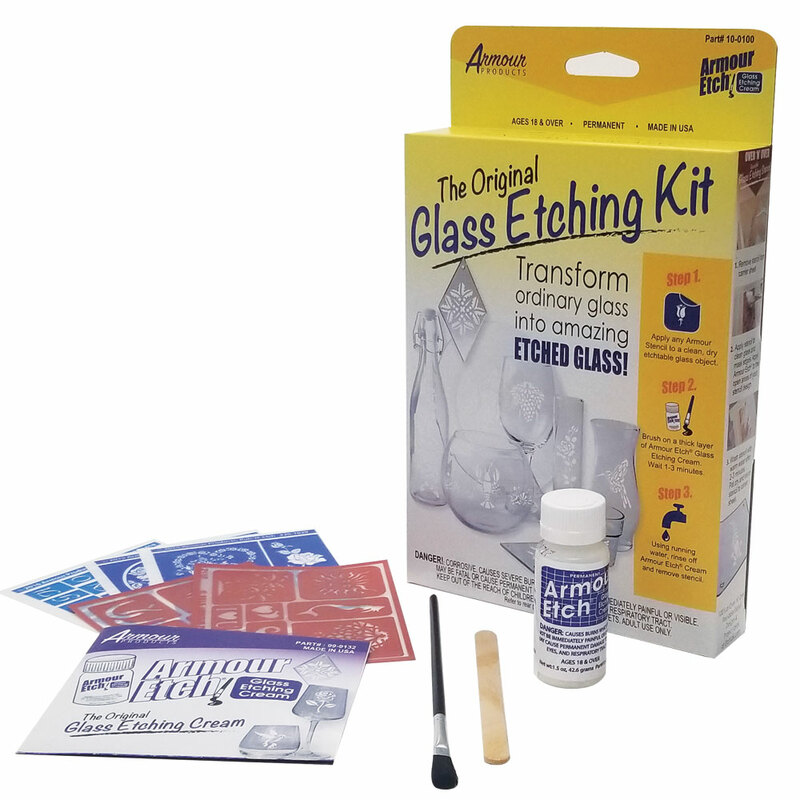 Follow the instructions on the glass etching cream you have purchased. The etching process is pretty quick to apply it next you a running water source. That way if you happen to get any on your skin you can quickly rinse it off. Please remember this is a caustic substance and can eat away at your skin. Be safe and use precaution and proper safety gear. Gloves are highly recommended, as is a well ventilated work area next to running water. If you do happen to get some on your skin rinse under high flowing cold water for at least 15 minutes. As per instructions I used a wooden stick to pile on a helping glob of cream and let it sit for about a minute. I then ran it under cold water until it was all rinsed off. If you are concerned about the cream etching your pipes, don’t be, but you can run cold water down your sink for 2-3 minutes if you want to ensure you have full diluted the cream. I think they turned out pretty awesome, don’t you? Now while these are awesome drinking glasses, I also wanted to make something a little more personal for her. My gift exchange partner is going to school to become a forensic investigator! What an awesome degree huh? So I decided to make her a some artwork that encompass that goal. I used sketch pens to draw the finger print and cut the microscope out of card-stock. I used dimensional tabs to lift the microscope off the paper. I framed it in a frame that had some depth to it so the microscope didn’t get all smooshed. In return I also received a box of goodies from my exchange buddy. Don’t you just love the “Talk Nerdy To Me” bag? This was a super fun event and I am so excited to get back into glass etching. I can’t wait to etch my next project. Check out some more projects from the talented women who participated in this event. Categories: She's Crafty, Silhouette Challenge, Silhouette Crafts | Tags: Etching, Finger Print Art, Forensic Investigator Art, Forensic Investigator Gift, Glass, Glass Etching, Glass Etching Cream, Glass Etching with Silhouette, Hand Made Gift Exchange, Silhouette, Silhouette America, Silhouette Art, Silhouette Cameo, Silhouette Challenge, Silhouette Crafts, Silhouette cutting machine, Silhouette Gift Exchange, Silhouette Ideas, Silhouette Sketch, Silhouette Sketch Pens, Silhouette Stencil, Silhouette Studio, Silhouette Studio Software, Silhouette Tips 'n Tricks, Stencil, You've been poisoned glasses | Permalink. I laughed immediately when I saw this photo! What a wonderful idea! I have a little pirate in my house that would love this glass. I need to work up the courage to try etching. I love the talk nerdy to me bag that you received from your partner! You both were so creative in your gift giving! I had a to giggle when I saw the poison at the bottom of the glass. Then you were so creative with the Forensic tribute art. Awsome! Wow this is a lovely glass and one my grandson’s would love, you have given me the idea now thank you. I also love your forensic project too. Thanks for sharing with us at Silhouette Challenges this month.